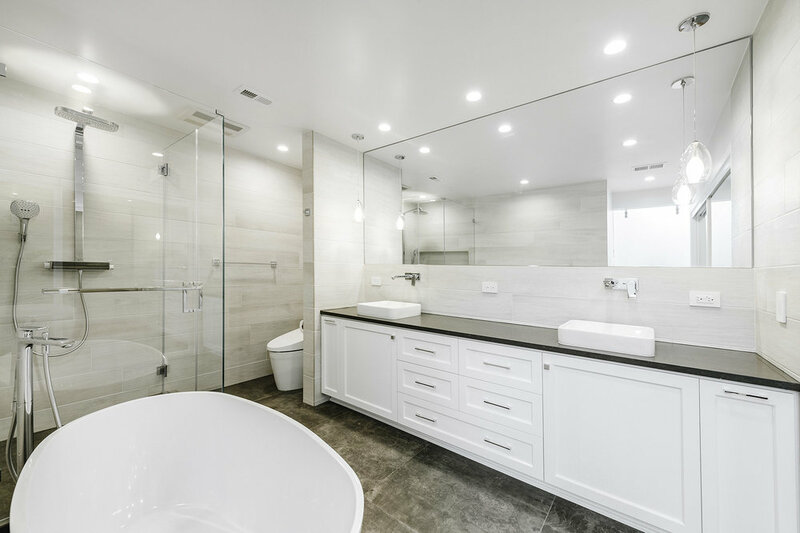 From dark and outdated to spacious, bright and modern spaces, the guest and master bathroom in this Beverly Glen home were completely transformed with our client's vision and needs in mind. The master bathroom received a new floor plan, with the removal of a side wall to create an open space. Raised ceilings also were added to give the impression of an even brighter bathroom. 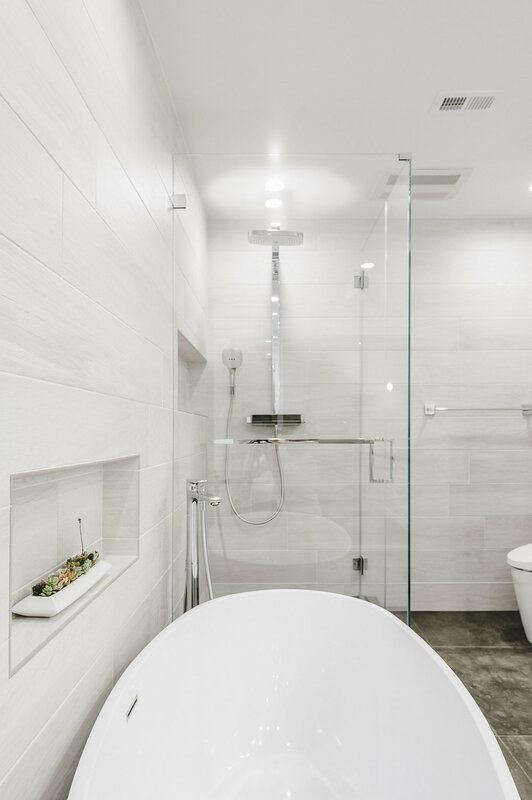 The space also features a larger shower with custom frameless glass enclosure, custom shaker 9" wide vanity with two vessel sinks and Caesarstone Raven countertop, custom frameless mirror, a new oval freestanding bathtub, Hansgrohe fixtures and a modern multi-function Toto toilet. The walls feature wood looking porcelain tiles, contrasting with the grey pattern porcelain tiles on the floor. The bathroom, that didn't have an entrance door before the remodel, now also features a custom frameless glass barndoor for added privacy. The new guest bathroom features a shower tub combo with white Italian porcelain subway tiles and custom wall to wall shampoo niche; premade white lacquer flat panel vanity, wall mount faucets and shower from Graff with a chrome finish; slate concrete look porcelain tile floor from Spazio LA Tile Gallery and custom frameless shower door. The remodeled master bathroom features porcelain tiles on walls and floor, an oval freestanding tub, custom shaker 9" wide vanity with vessel sinks and Caesarstone Raven countertops, Hansgrohe fixtures, custom frameless mirror, glass pendant lights, Toto's multi-function intelligent toilet, custom frameless glass doors and custom frameless shower door. Outside view of master bathroom featuring new custom glass barn door.